Burrito nights are always fun but a lot of work. So many little dishes to make so that we can take a little of each dish, mix it together and fold it into a tortilla with plenty of hot sauce. YUM! My friend and I decided to team up and have a burrito night. Have two cooks really makes it more fun (and easier). My job was to prepare the skirt steak for the burritos. I always love Mexican steaks. The flavors are always spicy and intense. So, I decided that I can’t simple put some salt and pepper on this skirt steak. So, I mixed my own steak seasoning. You can use a little or a lot, allow the meat to marinate and grill to perfect! 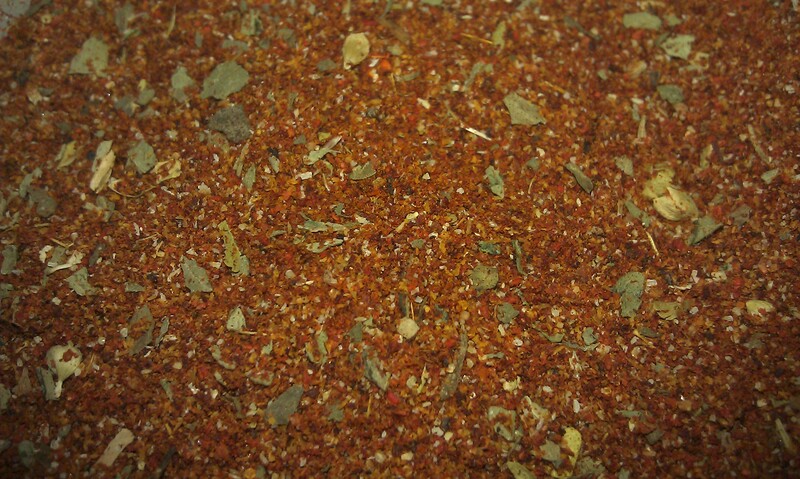 Combine spices and store in an airtight container until ready to use. Goes well with steaks, chicken or pork. Looks like an excellent marinade, however remove the black pepper from your marinade. Black pepper burns when it touches heat thereby negating some of the other flavors. Add it during the last minute of cooking. Experience: 15 years professionally trained Executive Chef. Thank you for the advice Chef! Sounds so flavorful! Thanks for the recipe! I am so glad you stopped by and I hope you enjoy the seasoning. Happy Cooking! Welcome to saminacooks.com! I am also on twitter and facebook! Hope you enjoy your visit! Also, thank you Adam Giacalone for your wonderful artwork! Proud Member Of The Daring Kitchen! Samina Cooks · Come in, Cook and share!